The Karen Ethnic Affairs Minister of Mon state, Saw Aung Mya Khine provided Karen traditional clothes and musical instruments to the Karen Literacy and Culture Committees of five universities in Mon state. 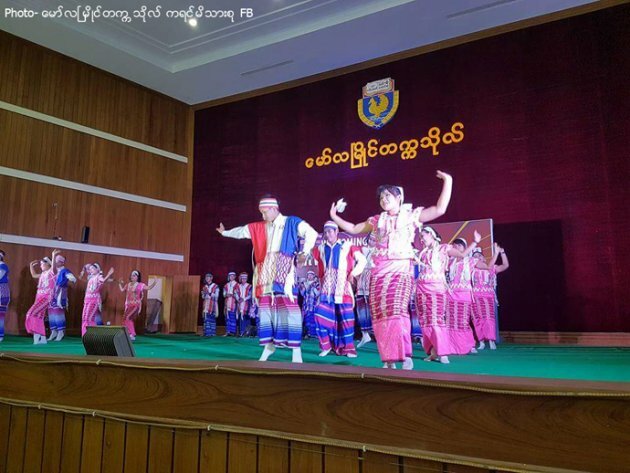 The Minister, Saw Aung Mya Khine said that “The Students in the Karen Literacy and Cultural Committees from these universities have their art and culture group for Karen special occasions or state level government ceremonies. It has been a challenge for students from some universities as they need to rent traditional cloths and instruments for their Karen custom ‘Done’ dance.” Each ‘Done’ dance group from five universities was provided with funds to buy a set of forty traditional clothes and instruments. With the budget from the state government, Karen Literacy and Culture Committees from Mawlymyine University, Technological University, Computer University, Government Technical Institute and Institute of Agriculture in Mon state were granted 1.5 Million Kyat each. The secretary of the Karen Literacy and Culture Committee of Mawlymyine University, Saw Win Naing said that “The committee couldn’t raise much funding with the time we all spend on our studies. With the prize money we received from our traditional ‘Done’ dance in government events and Karen New Year ceremony, we buy and collect instruments. It is not sufficient. With the government support of traditional cloths and instruments, we would be able to present our traditional dance more effectively and successfully”. Mon state government has granted 15 million Kyats for 2756 Karen New Year Ceremonies, 60 million Kyats for collective closing ceremonies of Karen Literacy and Culture Committees 16 million Kyats for Wrist-tying ceremonies in the state level, and now 7.5 million Kyats for providing traditional clothes and instruments to Karen Literacy and Culture Committee of the universities.